Full results from France as Titouan Puyo and Olivia Piana claim Week 3 of the EuroTour in Vendée. 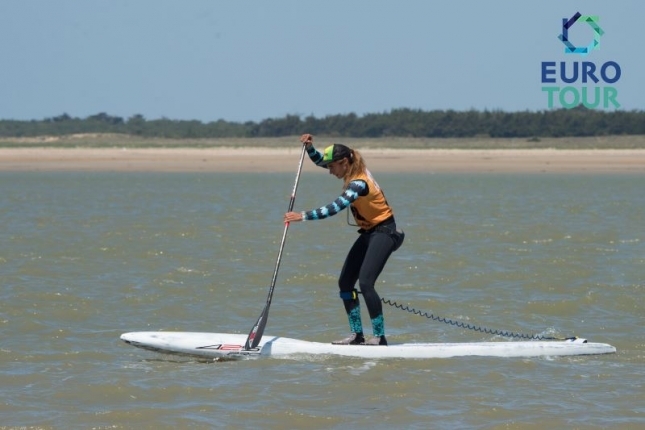 French stars Titouan Puyo and Olivia Piana have saluted at home after winning Saturday’s part-downwind, part-sidewind “Vendée Gliss Event” on the country’s west coast as the European Summer of SUP starts to heat up. 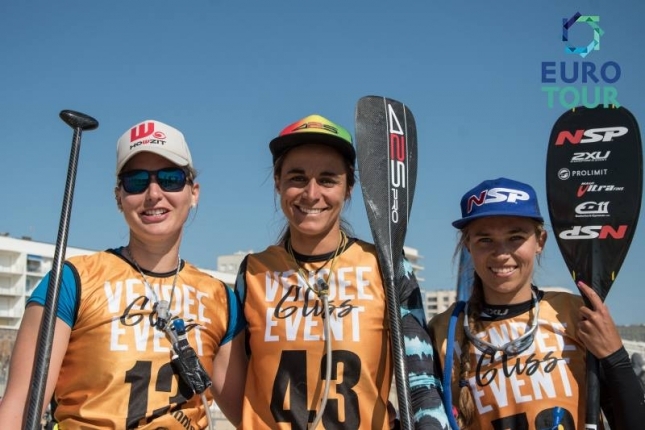 Olivia was too strong for fellow Frenchwoman Amandine Chazot and downwind surprise packet Noelani Sach from Germany, with the latter upsetting more seasoned veterans to record her second career EuroTour podium and no doubt strongest ever result. 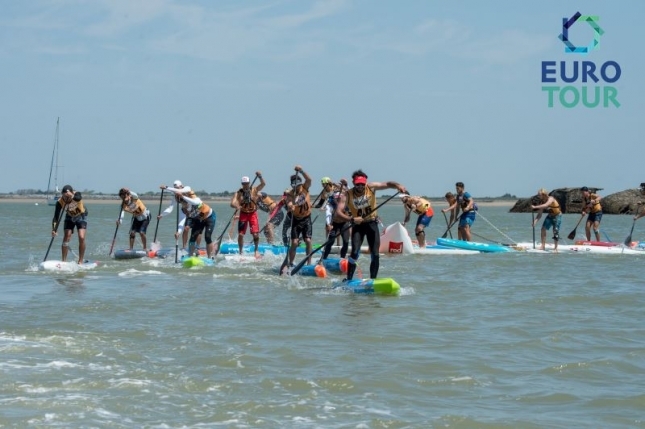 The field was tight early as competitors filed out of the murky estuary and into the open ocean for the southward paddle home, but once the wind kicked in the paddlers scattered in all directions. Some scattered a little too far, with the front-runners losing sight of the lead boat (or the lead boat perhaps losing sight of the next buoy) and veering off course before a quick correction. Bruno Hasulyo attacked early with a seeming intent to prove he’s not just “a flat water guy,” and indeed he would go on to make that point by the end of the race. However nobody could stop Titou, and once the Frenchman knew he was on the right course he opened the after burners and rocketed away on his made-for-downwinding NSP 14 footer. Titou was looking so comfortable that he was even inventing moves with his Quickblade Trifecta blade — at one point feathering with a twist of the wrists and steering his board as if carrying one of those big outrigger steering paddles. But while he couldn’t catch Titou, the fact Bruno held off ocean masters Arthur Arutkin and Marcus Hansen is a huge compliment to the Hungarian who looks to be fitter than ever. This guy is seriously in the hunt for a top finish on both the EuroTour and Paddle League leaderboards in Season 2018. Bruno may be joined at the top of the rankings by his brother, Daniel, after the elder Hasulyo put on a Tour de France-style burst up the mountain to jump from sixth to third in the final few kilometres. 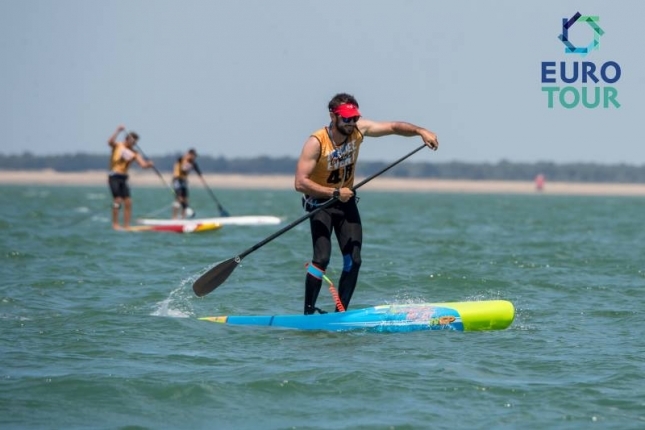 Seemingly out of the hunt with less than half an hour to go, Daniel found a second wind and first reeled in Vinni Martins from Brazil before overpowering Marcus and Arthur as the downiwnd bumps died and the sidewind grind tested the athletes’ strength and stamina. Nobody could stop Titou though, with the famous New Caledonian claiming the win just an hour up the coast from his family’s French summer house. The race was certainly a tale of two halves: The opening 8km or so in the ocean offered up some surprisingly fun downwind bumps — the course was changed to Plan B after north winds forced the original island-mainland crossing had to be abandoned — while the final half was a sidewind grind as competitors limped back towards the coast for the final stretch down the coast. Brazil’s Vinni Martins looked solid early and held on for a top six finish, while the battle of the day was between Arthur Arutkin and Marcus Hansen; After 23km of open ocean paddling, the two hit the sand side-by-side only to find a further 200 metres of sand running in front of them. The beaches in this part of France are huge, which meant a leg-burning run to the line that proved too much for Marcus. French duo Tom Auber and Martin Vitry looked good as well, while Leo Nika and Ludovic Teulade rounded out a very solid top 10 in a race that was strictly capped on entries due to the huge logistics involved (there was at least one safety boat for every five competitors). It was all Olivia in the women’s race, with the Frenchwoman crossing two minutes clear of her closest domestic rival. Amandine looked solid but Olivia’s ocean experience was just too much. After a runner-up finish in Carolina, Olivia is going to join the likes of Yuka and Fiona as they throw everything at runaway ratings leader Sonni Honscheid. It’s a fresh start here in Europe though, with last year’s EuroTour runner-up Olivia looking to dethrone the three-time Queen from Germany. However the big story of the women’s race this weekend was Noelani Sach, an unheralded youngster from Germany who gave NSP their first women’s podium in some time. After being overpowered by her more seasoned rivals in the first two weeks of the Tour, Noelani broke away from the peleton during Saturday’s 8km downwind stretch before holding on in the grueling sidewind stretch to record a great result. Thanks to the Vendee Gliss organisers for a fantastic day at the beach and a thoroughly well organised event (it felt like we were at a military bootcamp during the race briefing), and big shout out to the EuroTour crew for stepping things up this year and once again hosting the pinnacle of European paddling. 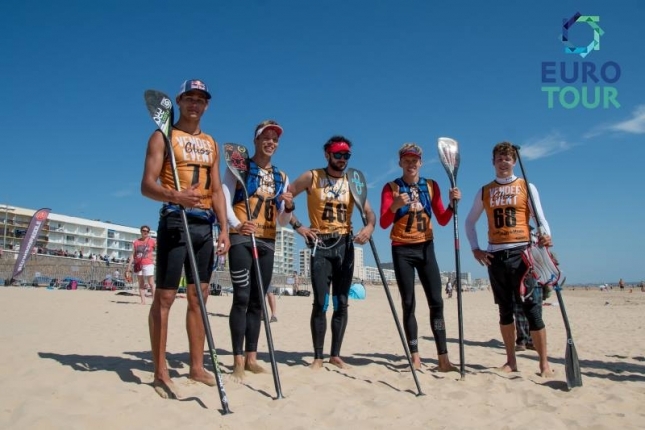 The EuroTour has joined forces with The Paddle League this season to help strengthen stand up’s two main tours and bring more unity to the sport. 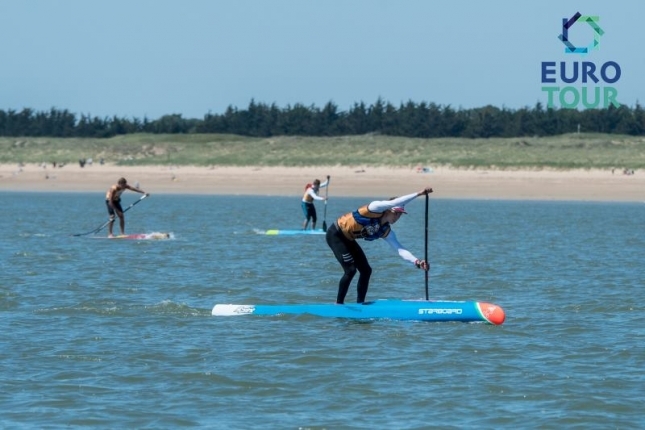 You’ll hear more about this in the coming days, but the short version is that all EuroTour events are now part of The Paddle League, and all summer races in Europe are EuroTour events. Note that in this transition year, the points systems are still slightly different: The Paddle League World Rankings will always follow the “season 2018” star ratings, while the EuroTour has a simpler system that sees Holland, Belgium and Finland on 2-stars, Vendee, Crete, Alicante and San Sebastian on 4-stars, and the “Big Three” of Bilbao, Hossegor and Germany all on 6-stars. Check out the great recap edit below plus the full EuroTour photo gallery on Facebook. And if you’re feeling really keen, you can also watch a full replay of today’s EuroTour live stream to relive the race (skip to the 2 hour 34 minute mark for hte infamous “running interviews” — I’m still outta breath). Full results below. See you all in Greece four week 4! What an epic weekend in Saint Jean de Monts, France. The Vendee Gliss event, was one to remember and the 23.7km course a true test of endurance for everyone. Check out this great recap video by our fantastic crew #ThomasVincent & #FlorentMouillon and also images by #StephaneDebuire & #MurielVanderbempt Thanks again to our host #PhilippeLeDuault #OfficedeTourisme & the whole team for a fantastic event. A bientot La France.